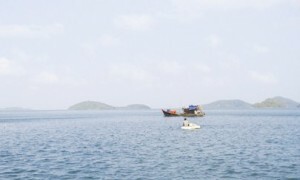 Ba Lua Archipelago was formerly named Binh Tri Archipelago. According to local stories, during the French occupation, many French people came to Ha Tien to do business and they had considerable influence on colonial authorities. Ba Lua was the name of a very beautiful Chinese-Vietnamese woman living in Ha Tien. As her Western husband was extremely powerful, she owned all the islands. Hence, people named them the Ba Lua Archipelago. Although the archipelago has many islands, islets and caves, only 10 islands are inhabited, with a population of around 2,300. These islands were mostly formed by limestone mountains, which are less than 100 meters high and are clustered off the shore of Chong Islet. Forty-five islands there were christened after their shapes and local folklore such as Pig Islet, Goat Islet, Mangrove Islet, Nhum Ong (Male) Islet, Nhum Ba (Female) Islet, and Re Lon (Groom) and Re Nho (Groomsman) islets. Surrounded by many islands in shallow waters, Ba Lua Archipelago rarely encounters strong winds and big waves. As such, it is suitable for tourists to take a boat for sightseeing. If tourists want to travel on the archipelago, they’d better use small boats to navigate in the shallow waters and weave through canyons to disover the caves. Mountains of various shapes and sizes result from the erosion of rainwater, sea waves and ground water over millions of years. Tien Cave, which is 150 meters long through the inside of a mountain following the axis of the southwest and northeast, is a masterpiece of nature. Therefore, tourists often enter the southwestern gate to visit the cave and when going out, they can take a bath at a dreamlike beach. Ba Lua Archipelago is always blue and tranquil all year round. The water is so clear that tourists can see fish swimming freely under the sea. At the Hang Pagoda tourist wharf on the Phu Tu (Father and Son) Islet, tourists can buy tickets to take a one-and-a-half-hour voyage to Ba Hon Dam. Following the sea route, they will see numerous islets of various shapes appearing ahead. Of these islets, some have not been named and tourists can give them one using a bit of imagination. Sometimes, tourists will see friendly dolphins racing, frolicking and somersaulting around the boat. Dolphins and dugongs often appear around the beaches of Ba Lua Archipelago, Nghe Islet and Phu Quoc Island. The sunrise and sunset on Ba Lua Archipelago offer some of the most beautiful moments that nature has. Sea breezes invite tourists to discover the mysteries of these beaches and islands. Back home, they will never forget the charming landscapes and the hospitality of local islanders.